A compact photo printer the whole family can enjoy. 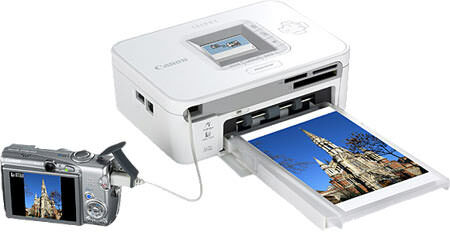 The SELPHY CP740 makes printing at home fun and affordable. With a range of different print sizes, the results you want are always close at hand. Here is a link to the helpful page on the Canon website describing it. Super! And that's exactly what I bought it for. I have had issues with HP printers in the past, so I refuse to buy any HP printer device. But with Canon I felt I should be fine. It promised to deliver the convenience of being able to give someone a copy of a photo straightaway, rather than forget and feel guilty next time I met them. However, this device started giving me trouble quite soon. The paper feeder grew reluctant to drag the paper in, resulting in fun and games trying to cajole the printer to work. I put up with this, since he printer was an "occasional use" item. However, with teenage daughters and their art projects making increasing use of the printer, the failure rate went up. When it comes to technology in my house, the buck tends to stop where I happen to be standing. Today the printer complained that it needs a new ink cartridge. No problem. Some time back I bought a bumper box pack of Canon consumables for the printer (postcard-sized photo paper and ink cartridges). So now these ink cartridges are not brand new but they are all indiviually sealed in their cellophane wrappers. Ink cassette is empty and must be replaced. Press [Resume] to resume, or [Cancel] to stop. I have put three of these out-of-the-wrapper ink cartridges into the unit but I get the same error. I am suspecting that the ink cartridge is not to blame but that the device has failed and the error message is bogus. I really hate to waste money like this. Here's that page with their contact details. They even have a telephone help desk, so that is good, but wait a minute: I have to call them during the week, when I am at work, and therefore not at home with my computer and printer. So suddenly this Telephone Help Desk becomes abourt as useful as an ashtray on a motorbike. I'd need to request a half-day off from work to go through with getting any meaningful support. And the cost to me of doing that would be more than the cost of a new printer. I am wondering if maybe Canon do not really want me to get in touch with their Help Desk. Could it be that they would rather I bin the printer out of hand and just go out and buy a new one? Surely not! Have they not given some thought to how I might be feeling about such a cynical approach and such apparent subterfuge and the resultant likelihood of me thinkjing twice before I choose to buy Canon again? I thought it was worth a shot sending an email to the Canon support address to let them know of my disgruntledness. Below is what I wrote. It will be interesting to see what response I get. I promse to update here with the result. I wanted to contact your support function directly to get a diagnosis of the problem that has occurred with my photo printer. Trying to follow through with a support ticket via email is painstaking and inefficient. Unfortunately your Telephone "Support" line is open to calls only during regular business hours when I am at work. When I am at home and able to be next to my printer, namely at the weekend and in the evenings, your Telephone Support line is closed. This seems insane from a customer-service point of view, given that this is a home use product. I am disappointed with the product because it failed to live up to expectations, and I am disappointed with the approach to customer service exhibited by Canon.